I have always had a thing for pom-poms. They are so fun to make and can be used for so many different things: present toppers, decorations, jewellery, homewares, you name it. Here's a fresh new take on the traditional pom-pom in the form of fruit! Pom-pom maker (either make your own, or buy one from craft stores. We used a Clover pom-pom maker). Open up the pom-pom maker arms on one side. To make the shell part of the watermelon, begin by wrapping one layer of dark green wool around one side of the pom-pom maker. After this layer is wrapped, cut the wool from the ball. To give the watermelon shell a striped effect, wrap one layer of light green wool around the same side of the pom-pom maker, covering the dark green layer. Cut the wool from the ball. Next, wrap a layer of dark green wool, cut, then follow with more light green. Repeat until there is a thick layer of wrapped wool around these arms of the pom-pom maker. To create the red fleshy part of the watermelon, open up the other set of arms on the pom-pom maker and begin by wrapping a layer of red wool around them, snipping the wool from the ball after this. Wrap a black piece of wool over the red layer, but only a couple of times. This will form the watermelon seeds. Cut the wool from the ball. Wrap a red wool layer over this, cut the wool, then repeat with more black and so on, until there is a thick layer of wrapped wool around these arms of the pom-pom maker. Close the arms of the pom-pom maker. With sharp fabric scissors, slot the bottom blade into the groove of the pom-pom maker and start cutting all the way around. Wrap a piece of red wool around the pom-pom and pull tightly so it slots into the groove of the pom-pom maker. Wrap it back around and tie in a tight double knot to secure. Pull the two halves of the pom-pom maker apart and remove the pom-pom. Give the pom-pom a little haircut, shaping it with scissors to be perfectly round. Don't cut the red wool you used to tie the pom-pom, as you will need this for hanging. Pom-pom maker (either make your own, or buy one from craft stores. We used a Clover pom pom maker). Open up the pom-pom maker arms on one side only. To make the leaves of the watermelon, wrap light green wool until there is a thick layer of wrapped wool around these arms of the pom-pom maker. Close up the pom-pom maker. Using sharp fabric scissors, slot the bottom blade into the groove of the pom-pom maker and start cutting all the way around. Wrap a piece of light green wool around the pom-pom half you've created and pull tightly so it slots into the groove of the pom-pom maker. Wrap it back around and tie in a tight double knot to secure. Use the same method as you did with the fleshy part of the watermelon (step 4 in the watermelon tutorial above) to create the pineapple body. 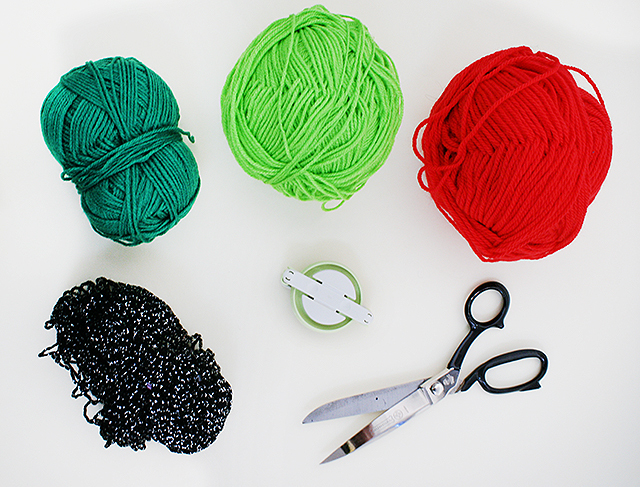 Instead of just wrapping one set of pom-pom maker arms, do both sets. Use light yellow wool layers for the main part of the body, and dark yellow to give the pineapple texture. Wrap these alternating layers until there is a thick layer of wrapped wool around both sets of the pom-pom maker arms. Close the arms of the pom-pom maker. With sharp fabric scissors, slot the bottom blade into the groove of the pom-pom maker and start cutting all the way around. Wrap a piece of yellow wool around the pom-pom and pull tightly so it slots into the groove of the pom-pom maker. Wrap it back around and tie in a tight double knot to secure. With the pineapple body still attached to the pom-pom maker, sit the leaves on top and pull the green string you used to tie the leaves around the pom-pom maker, pulling tight so it slots into the groove, wrap back around to the top of the leaves, then tie in a tight double knot. Manoeuvre the arms of the pom-pom maker so they are free of this knot and then pull the two halves of the pom-pom maker apart to remove the pineapple. Trim any stray pieces of wool from the body of the pineapple, then use the scissors to shape it into a slight oval shape. Make sure not to cut the leaves, you want them to be a bit bushy and spiky. Leave the green string you used to attach the leaves to the body as you will need that for hanging. You've now mastered the art of making some fairly tricky pom-pom designs - well done! Now that you've created your own miniature fluffy fruit, you might like to apply these skills and techniques and experiment with other designs, like strawberries or cherries. What are you going to do with your fruit pom-poms? Perhaps you'd like to tie them to the handle or zipper of your bag, or make them into some cute keyrings? You could also make an awesome pom-pom mobile, or even create a cute necklace of fluffy fruit. Or how about Christmas tree ornaments? Share your ideas with us in the comments below. Hello! 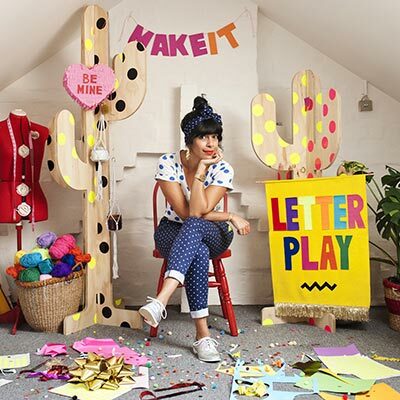 I am a craft-based designer and creative workshop teacher based in Melbourne. When I'm not teaching craft classes or writing DIY projects for various publications, you can find me making tactile, playful and colourful props, costumes, and decorations for the creative industry. Some of my clients have included InsideOut Magazine, Sportsgirl, Lego, City of Sydney, Wolfmother, SBS and Etsy.